My First Drama CD Experience – Funny Comic! This was a VERY interesting Sunday night INDEED. ANYWHO, after searching around I found out that people were reviewing Hakuouki Drama CD’s and I got excited! So I googled, looking for downloads… and I found that someone had put up 2 sound files named “Hakuouki Drama CD.” One with an image of Saito, and the other of Sannosuke. They are coincidentally my two favourite characters… although I do think that Okita’s voice makes me feel like I want to melt into a puddle of moe-happiness on the floor. 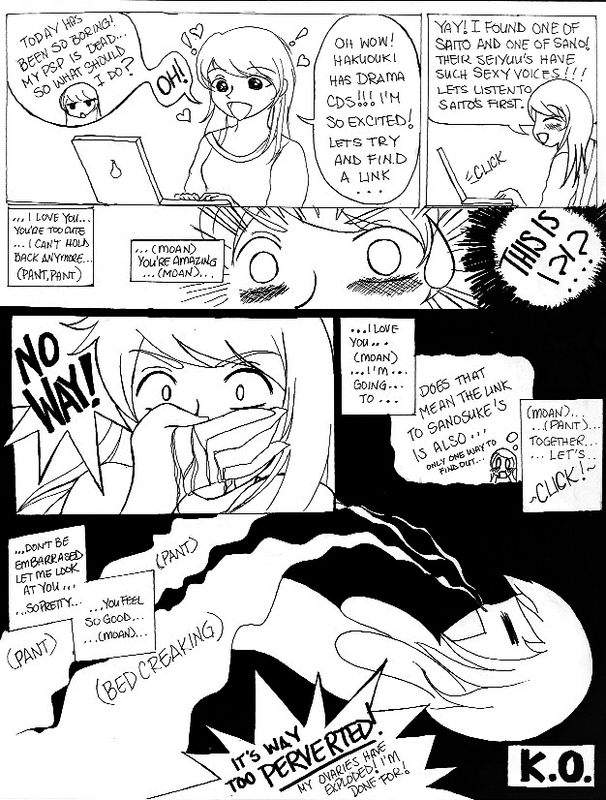 This is what happened after that – in comic form. That was literally what happened – well if I were an anime character of course. But i know ya’ll know what I mean. If you want to listen to it to understand what I went through its here. IT IS an M/R18 Rating and Not suitable for anywhere other than hiding alone in your room. I’m so lucky I was using headphones and I was at home when I found this. I was like so shocked and alarmed that stuff like this existed (and that i didn’t even know it for such a long time!) and I had to find an explanation because I just didn’t understand what this was… LOL – I guess it was too much to take in at the time. So I looked it up, haven’t figured it all out yet though, but I’m sure that these audio were not specifically from the Hakuouki series itself but of something else – Perhaps an R18 OtomeGame Audio CD – that had the same Seiyuus as the voices. If you listen to them (*cough* ahem *) again you get clues like, the way the character speaks, the kind of words and formalities they use, and voice pitch in the audio. They don’t align with the actual Hakuouki characters Saito and Sannosuke. Plus, (*cough*) beds were not used but futons…. so the creaking bed noise is a dead give-away. I’m still shocked that I came across something like that so…unprepared lol.